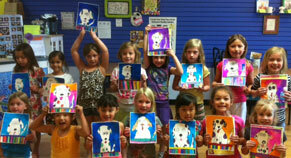 Myart Painting just for Kids, Ages 5&up at the Carmel Studio. Myart Adult Painting Events at our Carmel Studio! Call us to schedule an art class designed specifically for your Scout troop! Choose from a variety of themes and subjects as well as choice of mediums including markers, watercolors and pastels. We provide a step by step lesson on how to draw along with a demonstration of how to use the chosen medium. Your Scouts will love learning how to draw and will take home an amazing piece of artwork!